In several of the previous posts concerning small towns in SW France, I have failed to mention, or remind readers, that I had walked the French camino, or more properly the Chemin de Saint-Jacques-de-Compostelle, in 2013. The chemin du Puy-en-Velay extends approximate 750 kilometers from Le Puy-en-Velay to Saint-Jean-Pied-de-Port at the foot of the French Pyrénées, about the same distance for the Spanish camino that goes from Saint-Jean-Pied-de-Port to la cathédrale de Saint-Jacques-de-Compostelle en Galice (Espagne). From the map one can see that the pilgrimage routes from the east converge in France and funnel into three, some say four, routes that join northeast of St-Jean-Pied-de-Port and that route leads eventually to St-Jean-Pied-de-Port, the end of the chemin and start of the camino for those who are walking in Spain. The goal here is to account for some of the days of walking the French side of the pilgrimage route. This day, the 27th, leads to Nogaro, a town whose name comes from Nugarolium and is the village of le noyer or walnuts. DAY 27 de Eauze à Nogaro (peut-être 20km) sur Le Chemin de Saint-Jacques-de-Compostelle. In Nogaro I stayed at the Hôtel Le Commerce. Those are pretty scraggly looking chickens! 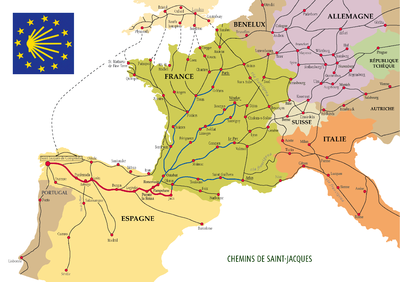 Where did you find the map of St. Jacques routes? Nice! Very interesting to know there’s a town named Nogaro, and that the origin means walnut. In Toulouse there’s a life-size statue of French singer Claude Nougaro, who was a native son. Wonder if it’s the same etymology. Probably. Wow. Totally free range looking chickens. And many of them en masse. In Hawaii, there are wild chickens but they look fatter. Village of walnuts. Is that a place where they’re grown?